What’s the “Social media currency”? Likes on Facebook, views on YouTube, followers on Instagram and so on, aren’t they? We live more of our lives on Social Media than the real world, don’t we? What if I could tell you, there was a machine which could get you this social media currency without a limit? That’s what this piece is about. To be honest, growing your subscriber base, fans, followers organically is no easy feat, it’s hard enough to get people to follow you to begin with, but to get to a level where the profiles actually look influential and give away the trust-vibe is near to impossible and generally takes years. That’s where services like Digi SMM come to the rescue. What if you could skyrocket your followers from couple hundred, to couple hundred thousand, or even millions in seconds and minutes, and at prices cheaper than your daily coffee-spend? That’s right, intrigued yet? Let’s get you acquainted then. Digi SMM Review: What is Digi SMM? Why you need social signals? That’s a good question, let me answer that. Suppose you spot an Instagram profile or a Youtube channel, selling something which is actually good, quality product, maybe even the best, and at an affordable price, but ask yourselves, would you buy the product if the channel has 10 subscribers, or the Instagram profile has 100-200 followers? Your most instant reaction would be that it’s a company trying to make a quick buck and scam you, even if the company is actually legit and with a great product, isn’t that right? That’s exactly what happens to you and your products. Another reality of the social media is, no one hits the follow/subscribe or like button for a profile with 10 view or 100 followers, but the same people smash the same buttons once they see a profile with sizeable numbers. Note that nothing changed, not your product, not your profile, it’s only the mindset which changed because now you have 10K followers instead of a 100, everyone wants to follow you, and that’s a reality. That’s exactly what happens to you, your profile, and your business. Creating the best, most affordable product doesn’t mean anything, if your followers don’t trust you to be professional and legit, and that trust can be earned if your profile is trusted by “x” thousand other members of the world, isn’t it right? 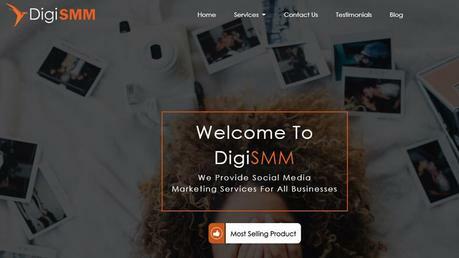 What are the Services you can Buy at Digi SMM? Instagram comments on your pictures. Instagram Auto Likes: Auto likers automatically like other content based on your choice, hence increasing your exposure and expand your network. That covers everything, doesn’t it? Considering this is a Digi SMM review, I like to keep things neutral, so as far as my own experience goes, I purchased Instagram followers from them along with likes which I purchase more frequently. In either case, it was delivered within 5-10minutes at max, so the speed is something I’m explicitly satisfied with. Then comes the pricing, well the plans start as low as $0.99 (lower than your daily coffee-spend, isn’t it? )so there’s not much to complain about either. Even though I personally didn’t try their other services, I’m sure if they delivered on Instagram, they’d deliver on the other platforms as well. Are the Social Signals Real? I asked myself this question too, so let me answer this for you in this Digi SMM review. Yes, they do not “create” fake profiles and provide you likes/comments from them, instead they have an algorithm which uses real profile, or real people to like your content. So every follower, view, comment you get, has a real person as the profile’s owner. In case you’re wondering, it’s completely legal and no “hack” is involved in the process, they do not hack into those accounts, it’s more like a loophole in the platforms which they utilise. They claim these to be forever, and in my personal experience it has been around 8 months now since I purchased my followers from them and they’re still intact, without a single unfollow, neither have the likes dissolved the tiniest bit. So yes, I believe they’re true to their words and these social signals are forever, this I’m stating based on my own experience and in respect to what they’ve said. Just in case you’re wondering, no it’s not illegal by any definition, not for you, neither for the company. The accounts, channels or profiles of anyone interacting with your profile aren’t compromised in any way, they’re free to unfollow you whenever they want hence enforcing free will and also making it completely legal and by the books. This is one of the prime aspects which forced me to scribble this Digi SMM review down, unlike other social media marketing platforms which ask you for passwords, date of birth and other such personal information, Digi SMM doesn’t! You simply show them the photo, video or profile you want to get the signals for, and that’s all. You don’t need to provide them with your E-mail ID, Password, and Date of birth or anything else. Whatever they ask is already publicly accessible, you only need to specify which media or profile is the one where you need the said signals, and they’ll be delivered. 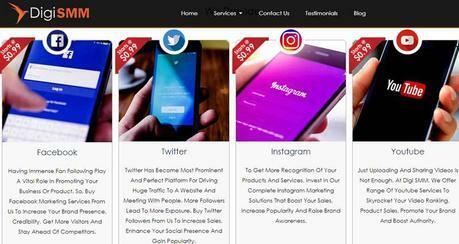 Ordering social media services from Digi SMM are quite easy, you simply head over to the website, select the service you want, simply enter the URL where you want the signals to be sent, along with an E-mail ID so you can get confirmation for the purchase and done! So yeah, even if you’ve never done this before I don’t suppose you’ll face any hardships and will be easily able to order whatever it is you need. Finally down to the last section of this Digi SMM review, obviously the product is something everyone needs, but does it fit your pockets? Well the plans differ based on the platform you’re buying them for, and the number of likes/comments/views/followers you need. But let me just say that most of them start as low as $1.99, for e.g. 100 FB Post likes cost $1.99, while a thousand YouTube views cost $9.99. So in order to get the exact price you’ll have to check their pricing page out manually. But all of these payments are one-time, so you don’t have to keep paying for the same social signals over and over again. So they’ve made sure you don’t have to fish for options while paying them and all these payment methods are trusted worldwide so there’s no false or extra charges on the cards either. 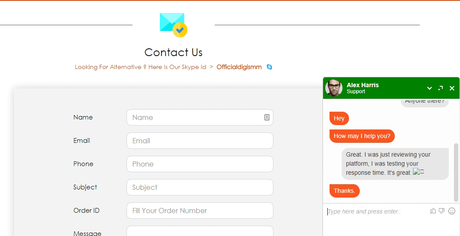 Their support team can be reached via Live chat, as well as an E-mail. I tried reaching them on live-chat and they responded within seconds, here’s the live-chat as it happened. As for E-mails, they replied to my test-mail within 3 hours (mail sent 11:05 a.m / mail received 2:30 p.m) so I’m satisfied with that as well. So that’s a wrap as far as this Digi SMM review goes folks, I’ve tried to present as many features of the platform as possible with utmost honesty and transparency. So finally, is it worth it? I’d say yes, totally. They’re offering a complete package, for all the major platforms that exist, at really cheap prices, and it’s a company which is nearly 4 years old now, so yes it can be trusted as well. Are there cheaper alternatives? Maybe, it’s totally possible. But then again, I myself have been a victim of buying cheap signals, which wither away couple days or weeks after purchasing them. On the other hand, those from Digi SMM didn’t. While reviewing a product or platform, I never state them to be the best or worst so I won’t do it in this Digi SMM review either, I’ll just say I am personally satisfied with them. But I’d urge you to check them out on your own as well to get a first-hand picture and experience of what they’re or not capable of offering. Anyway, do let me know your thoughts on this Digi SMM review (the article in itself) and on the platform as well in the comments section. If you buy automatic Instagram likes or any other services from them, feel free to share your feedback with us.